Manila, 16 January 2019 — What problems do you see this year? If you haven’t worked that out yet, you might get disrupted. What will this year bring for you and your business or organization? As a leader, you should be aware of changes, both the positive and negative ones. Why is that? Because leaders tackle problems and that starts with awareness. They take time to step back and learn. They look for patterns, trends, and the bigger picture of what is changing inside and outside their business. And in their personal life. There are many reasons for not being aware of problems this year. Human nature can easily trick us into not seeing changes happening and staying in our comfort zone. That means valuable time to make a difference will be lost. We can’t win that time back. What are these comfort zones? Let’s touch on three. First, the zone of being too busy. Always working and not making time and space to see the bigger picture. Employees who are too busy and focused for reflection are super active and therefore unaware of important changes coming up and the problems they can cause. We can call them the Workers, who fail to develop awareness because their head is always down for work. Second, the zone of holding back. In businesses, these are the professionals who are aware of what’s going on, yet not as engaged as they should be. Low levels of confidence or interest could be the result of a lack of recognition and appreciation from their managers. They might have lost their passion for the job. I regularly hear from coachees about the stress they have experienced from an unfriendly or even toxic climate at work. Unless they leave or become active, they hold back, and stay passive. We can call them the Waiters, because they wait to take initiative. Third, the zone of ignorance. People in this zone have yet to develop an awareness and appreciation of what their job, and their growth potential, is really about. They tend to passively follow instructions from their managers and advice from their colleagues. We can call them the Followers. They might be coping with a stressful situation in their personal life, triggering them to stay passive at work. Looking ahead at the changes coming up and the problems to be tackled this year, where are you in these four quadrants? If you are reading this post on leadership insights, it’s unlikely that you are a follower. However, all of us can get trapped from time to time in the Worker and Waiter zones. And when we are in these zones, we are preventing or holding ourselves back from stepping squarely and boldly into the leadership space, where we should be. In the leadership space, we tackle problems, turn situations around, and influence positive changes to happen. We can do that because we are keenly aware of the problems that are cropping up around us, and inside us, and we are committed to be active and take initiatives to tackle them. Staying in any of the comfort zones means that we assign ourselves to mediocrity, to a loss of valuable time in our life, to a risk of our business getting disrupted without being prepared for that, and generally, as the proverb said, to drop back instead of advance. What are the problems that are preventing your business from leveling up to be a top corporate leader in your market? More likely than not, your business will be facing some major problems that are only seen by the leaders who are aware and pay attention. Strategies and execution need frequent reviews, in ways that involve executives and professionals across the business in clear communication and active collaboration. That often doesn’t happen. A low level of engagement means that there are too many Waiters. I often hear about this in my coaching, and Gallup’s international surveys keep flagging this as a serious problem around the world, including Asia. Engagement should be seen by executives as a major problem to tackle with priority. Sadly, it often goes unnoticed or is not acted upon in favor of continuing business as usual. Heads in the sand. The revolution of digital transformation is in full swing and will disrupt your business negatively if your executives and professional teams are too busy with routine problems and thereby forego to prepare and tackle it. These are just some of the problems that businesses face to survive and thrive. The challenges and traps apply at the individual level too. At the start of the year, conducting performance reviews and preparing individual work plans are a great opportunity to step into the leadership space and get ready to tackle this year’s problems with awareness and a proactive mindset. 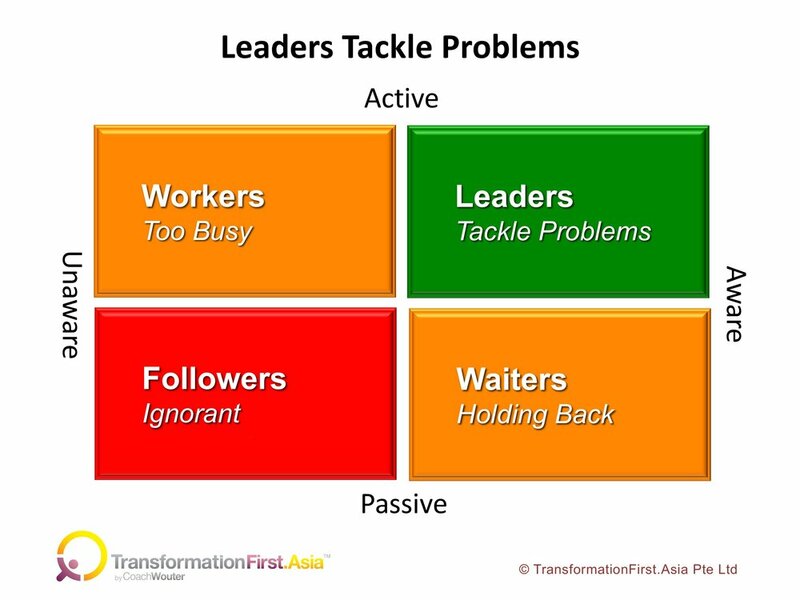 Let’s not get trapped into the behaviors of Workers and Waiters, but step into the Leader space now. Look carefully to see and decide which problems need your attention most, for your business and individually. Let these problems not remain unseen, and go ahead and tackle them. That way, you keep advancing in work and life, even when rowing upstream, and you don’t fall back.